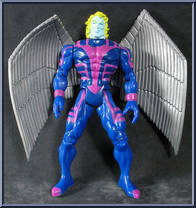 As the high-flying Angel, Warren Worthington III was one of the original members of the X-Men. 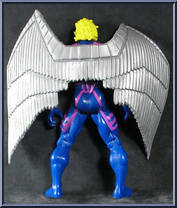 Years later, Worthington's real wings were dissected, replaced with razor sharp wings of steel, and he was transformed into Archangel, one of the four Horsemen of Apocalypse. Now, having fought against the conditioning that tainted and turned him into a living weapon, Archangel has embraced his humanity and strives to regain the purity that once surrounded him. Contribute pictures, update details or suggest corrections for Archangel II. Write a review about Archangel II.